The class 43 cabin right out from the printer: in the picture in the middle of the right column it is next to the first print I made at Shapeways (the public transportation card placed below -“credit card” format- is just as reference for the size), while the two on the bottom right show the piece with the support structure generated by the printer, then easily removed with a clipper. Both the upper part and the lower valance are much more “curved” and close to the original than in the first model. The outline of the chassis must match the open bottom line of the model. Being the model symmetrical with respect to the longitudinal axis, it’s enough to draw half of the outline, which is easily done by intersecting a plane with half of the locomotive model. For the cabin, only the lower valance is needed. Once the section is available, some hand working with the “Draft” workbench is needed, basically to downgrade the intersection object into lower level objects: first from a surface to a wire, then a wire into single edges. Once the edges are available, a wire closing the internal profile must be drawn, to be selected together with the the edges making the internal profile to be joined together again into a new “wire”object which will then be upgraded to a surface. This is the outer surface to be then extruded and cut through for housing the engine and letting the bogies to be connected (the whole object being mirrored to have it complete). The class 43 redesign is finished and ready for the 3D printer. It’s the right time to test the brand new printer at home, let’s print the cabin in white resin, with the highest precision available. Just started… it will take three hours, it will be ready after lunch 😉 . The first geometrical challenge puzzling my mind was how to combine together two ore more knot patterns, oriented at special angles one respect to the other, making it look like a continuous pattern, with no weird crossings or overlaps. As my first pattern had all crossovers at 45 deg, I thought the feasible choice would be to link two patterns at a right angle. The diagonal parts were already properly oriented, but it has been a little bit tricky to find the right distance between the two patterns to preserve the regularity of cross overs. After a few attempts I realised the obvious: they should have been placed at 90 deg one respect to the other, each pattern starting at the same coordinate of the side of the other, leaving a free square where they would intersect if extended, the side of which corresponds to the width of each thread. 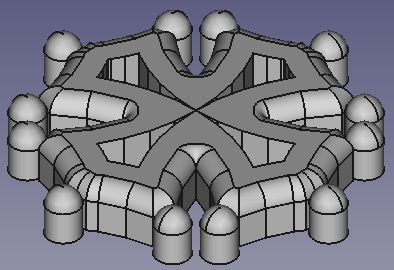 The next step is to design the angular connecting block, joining the threads of both patterns, in way that geometrically could represent a 3D physically possible continuity (my goal is to create 3D printable objects, not 2D “impossible” paintings). To be noticed that the angular block must match the geometry of the crossovers and the width of the threads: threads with longer or shorter elements, of the same width can use the same angular block. As an alternative, the horizontal thread can be moved up an left, to match it’s upper left diagonal side with the lower right diagonal side of the vertical thread, shrinking the angular part as in the picture. This is more compact but optically more tricky to imagine the vertical ribbon bending with a 45 deg angle and such a spiky external corner. It could be easier imagined as sheet of paper either folded as an origami or with the shapes cutout and then interwoven by hand. I’ve seen my nine years old son drawing this geometry on a squared notebook. He saw my interest and simply told me “mummy, I can show you how to draw it” and repeated the sequence of segments just for me. I started being captured by the sequence, the 2D geometry, the symmetry and I imagined it as a 2D projection of an “8” shaped spiky knot. I have always been fascinated by knots, especially as patterns, like the celtic motifs. This triggered me now as a 2D/3D designer and I came up with decomposing the shape in simple repeated elements to be reproduced as an array (copied, mirrored, turned). and repeated them in arrays with the same distance between elements. Then, mirroring the left array symmetrically on the other side of the “S” shaped one , I could easily reproduce a sequence of “two crossing ribbons”, without closing the ends as in the initial “8” knot. The three arrays all together compose the pattern I was looking for, made of the two simple basic sketch objects. It is still a 2D drawing, the 3D alternate overlapping of the two threads is left to the imagination of the observer, while it could be helped with colors. As a fan of the works of a geometry genius as M.C.Escher, I also started trying to imagine how this shape could be turned and placed in 2D space to auto intersect with its own copies… see my next post. on the left in raw brass and on the right in stainless steel. 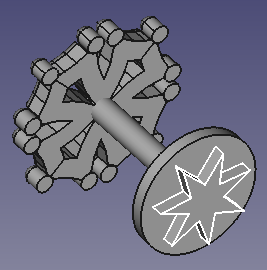 Now that the face has been refined, it’s time to complete the design of the cufflinks. 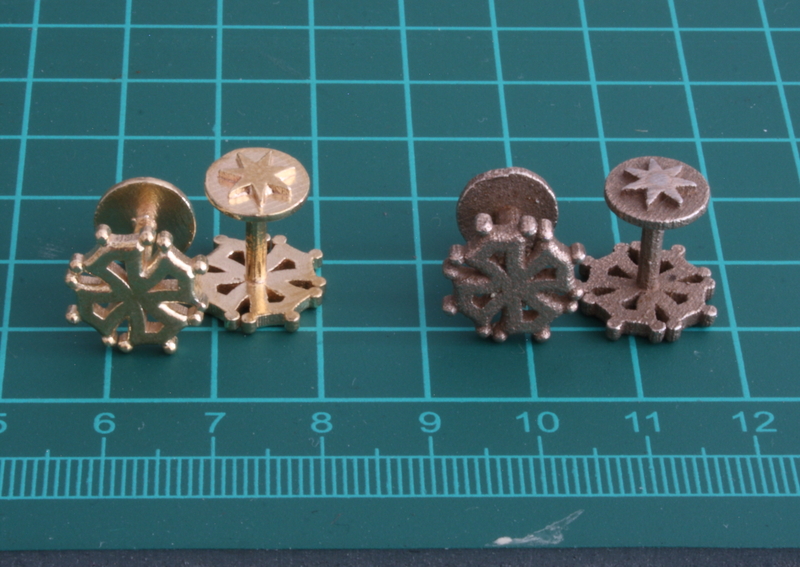 For this first cufflinks design I choose a straight post. On the backing I’m going to design the seven-armed star of the Felibrige, appe aring on the occitan flag, as complementary to the occitan cross on the face of the cufflinks. Being a simple seven-armed cross with a central symmetry, the drawing comes straightforward from basic geometry of a heptagon. I add a small round plate as support and connect the front and the backing with a cylinder.